Is precision medicine a matter of national security? No, that’s not a joke. It’s also about economic solvency and workforce productivity. BOSTON -- Here’s a new twist in the precision medicine plot: the U.S. needs it to adequately staff the military. 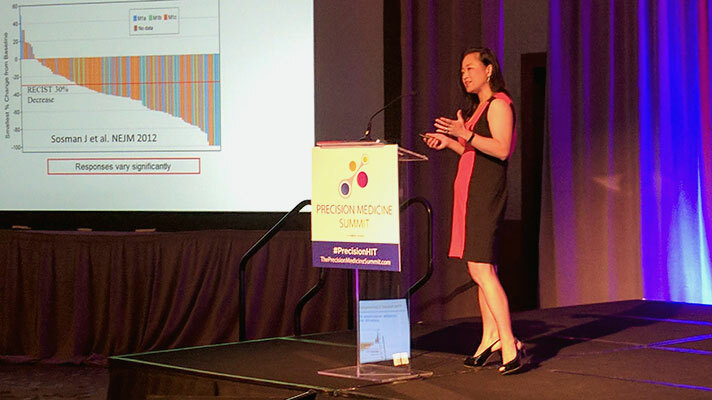 “This isn’t just about solvency, it’s about workforce productivity and national security,” Lynda Chin, chief innovation officer for health affairs at The University of Texas Health System said Tuesday morning at the HIMSS Precision Medicine Summit. Chin said that 8 out of 10 Americans who are ineligible for the military do not quality because of a chronic condition. That might not be as big a problem when the government is not drafting people but should that change and we have to put, say, diabetics that need insulin every day on the battlefield, it could become problematic quickly. The same goes for corporate workforce productivity, particular to employees with chronic conditions, Chin said, adding that preventing diseases and chronic conditions are critical to a healthier economy. Of the nearly $3 trillion the U.S. spends on healthcare annually, comprising 17 percent of the gross domestic product and rising, 86 percent of those costs go toward managing chronic conditions and that will continue rising as the population ages, she said. When it comes to hypertension, diabetes, and cardiovascular disease, 60 percent of the factors that contribute to a patient’s outcome emerge from outside the healthcare system, Chin said. Another big opportunity to lower spending is cancer because at least half of cancers can be prevented by behavior.